1Once a year for the past decade an eminent panel of nine experts – librarians, archivists and academics – has met at the British Library to consider applications from individuals wishing to preserve vulnerable archival collections worldwide. 2The panel awards two types of grants. Pilot grants support initial exploration to locate and assess the state of endangered collections. These projects may serve as preparation for major grants which support the digitisation of collections. The digital images recorded by the EAP projects are deposited with local institutions and the British Library, which makes them available online. To qualify for a grant the material must be potentially significant for scholarship, endangered and from a pre-modern period. Importantly, the panel only awards grants where the resulting materials can be made open to access on the library’s website. 3So far the Programme has awarded 244 grants worldwide totalling £ 6m, giving between £ 500k and £ 900k each year. It has supported 91 pilot projects and 153 major projects. It has digitised collections endangered by environmental factors, neglect, obsolescence of materials or the vulnerability of the minority groups to whom the materials belong. Among the collections documented are records from the low-lying island of Tuvalu, under threat from rising sea waters, and murals on crumbling temples in India. The programme has digitised photographs taken by Buddhist monks in Luang Prabang, images that provide a unique view of monastic life and that had been forgotten for decades in storage. It has supported digitisation of traditional music and stories recorded on magnetic tapes and phonograph records from the mountains of Azerbaijan. It has also helped to digitise Hakku Patras, historic certificates of rights granted to families from dependant castes, which allowed them to practice their trade in the villages of Andhra Pradesh in India. Across the programme, the digitally preserved materials range from rock inscriptions to sound recordings, spanning the first millennium BC to the twentieth century, from Chile to Siberia. 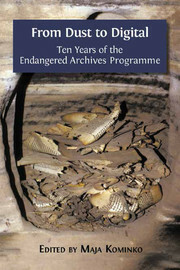 What the Endangered Archives Programme does In : From Dust to Digital : Ten Years of the Endangered Archives Programme [en ligne]. Cambridge : Open Book Publishers, 2015 (généré le 23 avril 2019). Disponible sur Internet : <http://books.openedition.org/obp/2215?nomobile=1>. ISBN : 9782821876262. Kominko, Maja, (dir..) “What the Endangered Archives Programme does”. Cambridge : Open Book Publishers, 2015. (pp. XLVII-XLVIII) Web. <http://books.openedition.org/obp/2215?nomobile=1>.